“The relationship between Jealous Gallery and CNB Gallery has been forged through a love and enthusiasm for supporting emerging artists and breaking down the conventions of traditional gallery experiences. Throughout the exhibition, a printing press will be set up in CNB Gallery, where, on the opening night, Jealous will invite members of the public to help demonstrate the art of screen printing. Jealous will also be inviting a local school, William Davis Primary School, to print in the gallery with Master Printer, Matthew Rich. Matthew will be introducing the young minds of the future to screen printing and helping them to produce their very own print to take away with them. 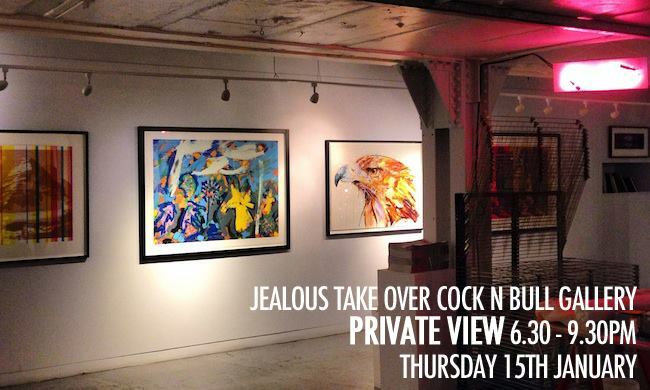 “Jealous has worked with contemporary British artist Dave White to produce his limited edition screenprints throughout 2014, with an exclusive print launch for the exhibition. After the sell-out edition ‘Eagle – Diamond Dust’, White has re-imagined the luxuriously beautiful eagle. The limited edition of only 5 prints will feature hand applied diamond dust and 24-carat gold leaf and will be exclusively launched at the opening. “Christopher is the son of two classical musicians, he was drawn so persuasively to indie and alternative music and playing in school bands as a teen that he added guitar, bass guitar and drums to his existing repertoire of viola and piano, studying all five instruments at the same time. The influences of these two distinct schools is clear in ‘Say’. Christopher wrote and recorded his album alone in his Glasgow flat on a bedroom studio setup, gradually adding each layer and each instrument one at a time, building up the breadth of the pieces. Though time-consuming, the process allowed for Christopher to lovingly assemble the intricacies and subtleties for this astonishingly intricate and subtle collection of music. The cover art for ‘Say’, an affectionate and purposefully stylised aerial view of Glasgow’s Clyde Arc Bridge, was created by Christopher himself. A skilled and accomplished artist, his work has been exhibited at galleries around Scotland”.